Hebrew U expert: The changing birthrate among different sectors may lead to a point where half the people be exempted from military service. Professor Sergio Della Pergola, a demographics expert from the Hebrew University of Jerusalem, said on Thursday that the changing birthrate among different sectors in Israeli society may lead in the future to a point where half the people who reach conscription age will have an exemption from military service. The analysis comes as the members of the coalition continue to be divided over a new Draft Law. Prime Minister Binyamin Netanyahu said on Thursday that he would be willing to impose personal sanctions on hareidim who evade service. He made the comments during talks with the leaders of the coalition parties. The new Draft Law has created a crisis in the coalition. The Draft Law committee headed by Kadima MK Yohanan Plesner announced its recommendations at a press conference on Wednesday morning, following a blow-up between Mofaz and Netanyahu, who dissolved the committee this week following internal dissension. 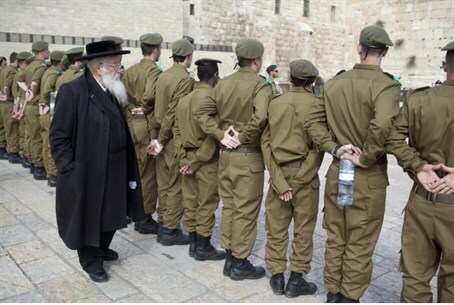 Plesner said he wants to heavily fine hareidi religious youth who refuse to enlist in the IDF but issued only general guidelines for the Arab sector. His insistence on this caused several members of the committee to leave and ultimately forced Netanyahu to dissolve the committee. Mofaz has issued a clear ultimatum to Netanyahu to adopt new draft law proposals if he wants to keep Kadima in the coalition. Meanwhile on Thursday, Netanyahu met to discuss the issue with Foreign Minister and Chairman of the Yisrael Beytenu party, Avigdor Lieberman. Lieberman told the Prime Minister during their meeting that the Plesner Committee’s conclusions are unacceptable to him and that he will demand that everyone, including Israeli Arabs, enlist at the age of 18.